Services | ProCo Hood Cleaning Denver, Co.
ProCo Hood Cleaning is a hood cleaning service company in the Denver, Colorado area. However, our expertise is not limited to just hood cleaning. We can also offer your business additional commercial kitchen cleaning services such as pressure washing your kitchen floors and walls, steam cleaning your kitchen equipment and offering fire safety devices as well. We are diverse in the services we offer, and we strive to outshine our competition every day. You see, we aren’t in this business just for a paycheck. We’re in it because we are passionate about it (yes, cleaning kitchens). It may seem funny to be so passionate about cleaning kitchens, but to us, it’s more than that. Our services will help your business succeed. We will keep your business safe. Our services will provide you with the tools you need to make your business successful and stand out in the Denver, Colorado area. That’s why we do what we do. IS THAT BARBECUE SAUCE ON THE CEILING? 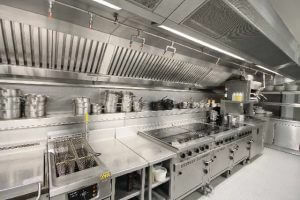 YOU NEED SOME COMMERCIAL KITCHEN CLEANING SERVICES ASAP. No need to blush. It’s pretty common. I mean, c’mon, it’s a commercial restaurant. Plates are dropped, people slip and fall…stuff happens. And the story behind that barbecue sauce that is on the ceiling doesn’t really matter as long as it can come off and won’t put a dent in your inspection. And the good news for you, barbecue sauce is an easy job for us. We are not just a hood cleaning service company. 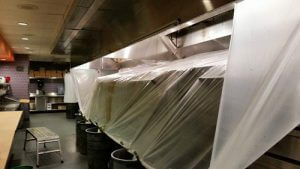 We will gladly come out and offer our additional commercial kitchen cleaning services as well. When we do a commercial kitchen cleaning we apply our pressure washing and steam cleaning services which will leave your commercial kitchen and equipment sparkling like new. Grease is a common problem in commercial kitchens because it builds up quickly and is very difficult to remove. Luckily, we are trained and have the proper equipment to take care of grease build-up. During an inspection, an auditor will often look at the grease build-up. This is a huge issue for the board of health, insurance, and fire marshals because grease build-up can cause a fire very easily. 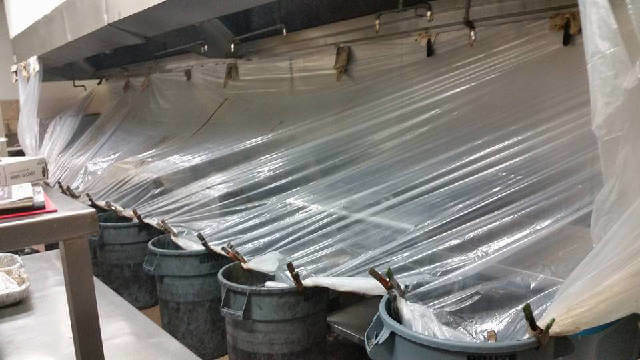 So if your commercial kitchen does a lot of frying, you’ll want to schedule a regular cleaning schedule with ProCo Hood Cleaning. Many restaurant managers or owners aren’t sure how to tell when something may need fixed, inspected or cleaned. The best thing you can do, is just give us a call. We’ll be glad to come out and inspect your kitchen equipment and kitchen hood system. We will look for all the potential safety hazards. If you’re on a regular hood cleaning schedule with us, we can inspect everything you want us to at that time. Then you’ll know that you’re always up-to-date. We want your business. Our goal is to build a relationship with you. ProCo wants to help your business grow and succeed by helping make your business sparkle. 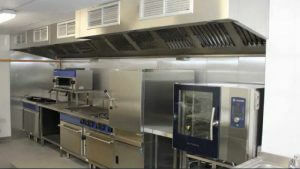 Call us today for outstanding commercial kitchen cleaning services.